Msgr. Flavio Capucci, Postulator for Bishop Alvaro del Portillo's Cause of Canonization, answers some questions about his life. 1. Why is Bishop Alvaro de Portillo a candidate for beatification? What has he done? His life was a constant “yes” to God’s demands. Bishop del Portillo gave himself heroically to the service of the Church and of souls, faithfully following the example of Saint Josemaria Escriva. He brought many people closer to God. To open a cause of canonization, the decisive factor is a well-established reputation for holiness, which is both spontaneous and widespread among a significant portion of the People of God. Bishop del Portillo’s cause was initiated because, right from the day of his death, there were very clear signs of this reputation. Many people all over the world were convinced that he was a saintly man and invoked his intercession with a view to obtaining favors from Heaven. The role of the “cause” is to verify that this reputation has a real basis. The decree regarding heroic virtues tells us that the Church has indeed reached a positive judgment about his holiness of life. In addition to his personal struggle for holiness, one should also consider the decisive push he gave to the creation of institutions for the good of others, such as the Monkole Hospital in Kinshasa (Congo), the Niger Foundation hospital in Enugu (Nigeria), the Campus Bio-Medico University in Rome, the Pontifical University of the Holy Cross and International Ecclesiastical College Sedes Sapientiae , also in Rome, where thousands of seminarians and priests receive careful doctrinal and spiritual formation. 2. What is his principal message? Alvaro del Portillo’s teachings include doctrinal matters such as the role of lay people in the Church, the foundations of the ministerial priesthood, and unity with the Pope and the hierarchy. However, I would underline as a general characteristic of his personality, the virtue of faithfulness. He was an example of faithfulness to the Church (first as an engineer, then as a priest and finally as a bishop), of faithfulness to the Popes he knew, of faithfulness to his vocation and finally to the founder of Opus Dei. Fidelity should be seen as a creative virtue which demands a continuous renewal both interiorly as well as exteriorly. It is not a question of simply “preserving” something, but of always drawing out new potentialities from the treasure one has received. 3. Of all his virtues which one would you emphasize? Those who knew him, in addition to his faithfulness, emphasize other virtues which might be considered as being lesser but which nevertheless are essential for a Christian. Among these we could mention affability and gentleness, because one could not say merely that he smiled a lot: he smiled all the time. Also good-heartedness, the capacity to spread around him an atmosphere of serenity, especially in difficult moments. And one should not forget his work ethic: he had an enormous capacity to work hard, never sparing himself, and even then his smile never left him. He was very demanding with himself and also with others: he gave the maximum and asked it of others. Nevertheless, in addition to all this, we should above all stress his charity. He loved God and others with his whole heart. He possessed the gift of a deep spiritual fatherhood. All those who approached him remember him as the Father, a good father who understands, who forgives, who has an unconditional confidence in others, in each person’s loyalty. Finally, I would like to speak of his humility: he never tried to impose himself or his opinions on anyone. When he was called to succeed Saint Josemaria at the head of Opus Dei, his governmental program had as it only goal continuity with the founder’s example. 4. 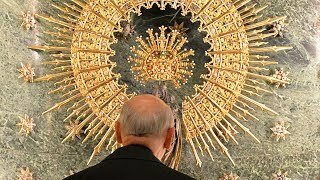 Is devotion to Alvaro del Portillo confined to Opus Dei? No, his reputation for holiness can truly be called a Church-wide phenomenon. We have received 12,000 signed accounts of favors received, attributed to his intercession, very often from countries in which Opus Dei is not as yet established. The newsletter about his cause for canonization has reached five million copies in print; ten million prayer-cards for private devotion have been distributed world-wide. One can truly say that Bishop del Portillo is a gift of the Church and for the Church. 5. What was Msgr. del Portillo’s role in the Second Vatican Council and in general in the Holy See? During the Council he was secretary of the Commission De disciplina cleri et populi christiani ,from which came the decree Presbyterorum Ordinis , and he was a “peritus” in the Commissions De Episcopis et diocesium regimine and De religiosis . Afterwards he was consultor for the Congregation of the Council, qualifier for the Supreme Congregation of the Holy Office and consultor for the Pontifical Commission for the revision of the Code of Canon Law. He was also a judge of the Tribunal for the causes of competence for the Congregation of the Doctrine of the Faith and consultor for the same congregation, as well as secretary of the Commission for Secular Institutes of the Congregation for Relgious and consultor for the Congregation for the Causes of Saints. Those who worked with him underline his determination to promote the rights of the laity in the Church’s mission (his book Faithful and Laity in the Church is a classic text of theological and canonical thought on the topic) and the beauty and importance of priestly holiness. 6. Does Bishop Alvaro del Portillo have anything to say to non-Catholics? As is well known, the nucleus of Opus Dei’s message, preached insistently by Saint Josemaria, is the sanctification of work. Bishop Del Portillo incarnated this teaching in an exemplary manner. He worked unceasingly throughout his whole life: first as an engineer, then as a priest and in his latter years as a bishop, always giving a deep meaning to his work, through which he sought the glory of God and the good of his neighbor. I think that precisely by seeing and living his work as the “hinge” for attaining holiness, he offers us a teaching of universal scope, valid not only for Catholics but for all men and women who want to give a transcendent and spiritual meaning to earthly realities. 7. Could you give us some data on the process? Who have been the witnesses? In accordance with the relevant Church norms, I can make known data that is of a public nature. There have been two parallel processes. One of these was carried out by the tribunal of the Opus Dei Prelature, since the Prelate was recognized as being the competent bishop in this cause. Nevertheless, as his own name figured in the list of witnesses, he considered it preferable that he not to be interviewed by his own tribunal, but rather by an external one, so as to more scrupulously guarantee neutrality in the whole process. Consequently, he asked the Cardinal Vicar of Rome to entrust to the tribunal of the Vicariate of Rome the whole task of interrogating the principal co-workers of Bishop del Portillo in the government of Opus Dei. These included himself, as well as several ecclesiastics residing in Rome. In addition, given the great number of witnesses who live far from Rome, eight other processes were held in Madrid, Pamplona, Fatima-Leiria, Montreal, Washington D.C., Warsaw, Quito and Sydney. In total 133 witnesses were interviewed (all in visu , except for two who gave accounts of two miracles attributed to the Servant of God). Among these were 19 cardinals and 12 bishops or archbishops. 62 of the witnesses belong to the Prelature; 71 do not belong to it.